Susan Collins (R.ME), an Irish Catholic Republican senator, is considered a centrist and bipartisan member of the Republican Party, described in Time as one of “the last survivors of a once common species of moderate Northeastern Republican.” She was first elected to the Senate in 1996 and she is the 15th woman in history to hold the position. Collins is a strong advocate for education. She led a successful charge to triple funding for early reading initiatives, authored the law providing a $250 tax deduction for teachers who spend their own money on classroom supplies, and co-authored the 1998 Higher Education Act. She voted to establish a Guest Worker program and on giving Guest Workers a path to citizenship, and yes on visas for skilled workers. 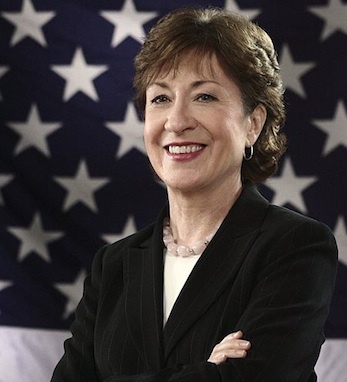 Collins has been a promoter of a strong national defense and homeland security. In the recent Don’t Ask, Don’t Tell Repeal Act of 2010, Collins voted in favor of it. Born December 7, 1952, Senator Collins, one of six children, was raised in Caribou, a small city in northern Maine, where both her parents, Donald and Patricia, served as mayor. Her family runs a fifth-generation lumber business founded by her Irish ancestors in 1844 and operated by two of her brothers.